Parents, are you interested in helping chaperone our Junior/Senior Prom? This special event takes place on April 29th from 8:00 - 11:00 at Commellini Estate. We are looking for 6-8 parents to join us for a memorable evening. If you able to join us, please call us at 465-7900. Tickets went on sale today, March 20th. Tickets are $40/couple or $25/single. Prices go up by $10 on April 17th. Last day to buy tickets is April 21st. As always, we love learning with your children every day. For questions, concerns or compliments, give us a call at 465-7900. Priority deadline March 10th. Space is limited. In order to enroll at Riverpoint Academy, families will need to provide information to our school to complete the process. Please see the information to follow. The Mead School District has its own smartphone application. 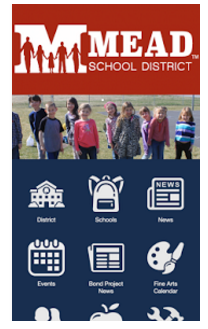 This app includes multiple functionalities and provides news, notifications, content from the Mead district website and social channels, as well as school-specific updates and content. We hope this app will prove to be a go-to source for easy, instant access to all things Mead. Read more . . .
Mead now offers a simple translate function for a variety of different languages, giving our students, staff and families the opportunity to read our website in the most comfortable language for them! Alumni, our annual luncheon is approaching! In the fall of 2016 Riverpoint Academy will, for the first time, be open to 9th-12th graders - a change from the current 11th and 12th grade model. To provide information to prospective students and parents Riverpoint Academy will host three Information Nights at their campus located at 11008 N. Newport Highway. Read more . . .